Here are some useful safety tips if you are or know someone who is a hoarder. If you would like more information and resources on hoarding visit the Help for Hoarders website. Make sure you have a working smoke alarm and test it weekly. Whether you use a traditional oven and hob, or other methods of cooking like a portable stove, make it a priority to keep the cooking area clear. Do not place items on, or close to heaters, lamps, or other electrical equipment. Do not store gas cylinders in your home as they are a serious hazard during a fire. If you have a medical need for gas cylinders, for example you require oxygen, they should be kept upright and outdoors where possible. Do not store cylinders in basements, under stairs or in cupboards with electric meters/equipment. If you smoke, use a proper ashtray that won't burn and put it on a flat, stable surface so that it can't fall over easily. Do not leave your lit cigarettes unattended. Avoid using candles or tea lights, if you must use them place them in heat resistant holders that hold the candle or tea light firmly. Ensure the holder is placed on a flat, stable, heat resistant surface. Keep the candles or tea lights away from anything that can catch fire, and never leave them unattended. 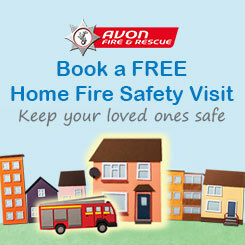 Plan and practise how to escape from your home if there was a fire. Choose an escape route and keep it clear of possessions - in the event of a fire this will help you to escape quickly or allow firefighters to reach you if you are unable to escape. Ensure possessions are stored on stable surfaces and do not stack items to a height that they become unstable - they could fall over blocking your escape. Newspapers and mail stored in bulk are highly combustible and will cause a fire to spread rapidly. Sort mail and newspapers on the day you receive them and recycle them on a regular basis. In the event of a fire, do not attempt to put it out yourself - leave your home straight away and call the fire service once you are safely outside. Do not stop on your way out to collect possessions and do not go back inside once you have escaped.